Ride further with less effort. The Haibike Sduro Hardseven LT 1.0 27.5″ Electric Mountain Bike – 2018 is an electric bike with 120mm of front suspension travel combined with a powerful pedal assist motor and long lasting lithium ion battery pack. 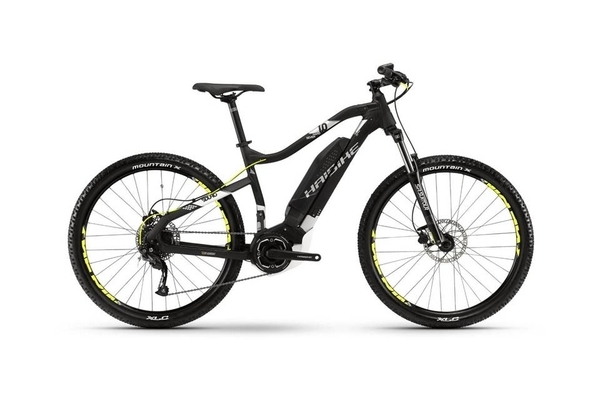 Fly up the climbs and as easily as the descents on the Fullseven LT.
Sporty and comfortable. From our new FullSeven LT (Long Travel) range of singletrack smoothing 120mm travel bikes are the ultimate in versatile all-rounders. The Yamaha LED display is a compact yet robust display and remote unit. Despite its small size, it provides the rider with all essential information. Positioned on the left of the handlebars, the remote is easily accessible?. Information available includes: the selection and display of the support levels (Off, Eco+, Eco, Standard, High), the current speed, the battery charge level, and the remaining range. The display also allows you to switch on and off of the main light.